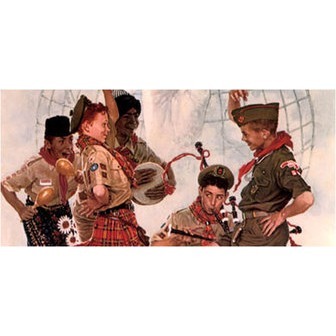 From the days of Lord Baden-Powell until these modern times the Boy Scout program has aided in the development of thousands of young men into fine citizens throughout the world. The Scouting program has been a huge success in the training of young individuals. The Boy Scouts of America (BSA) is one of the country's most prominent and the largest value based youth development organization. The organization provides programs for the youth of the country that helps to build character, teaches them to be responsible, to participate in civic duties and to develop overall physical fitness. The organization has been in existence for over 100 years and has helped to build the minds and characters of some of the country's top leaders, combining lifelong values with educational activities and also adding in some fun along with these vital lessons. The Boy Scouts of America believe through over 100 years of experience that helping the youth of the nation is key to the building a more responsible, conscientious and productive society. The BSA is located in all the 50 states of U.S.A. and has over 4.5 million members in different age related groups. Since the Scouts were founded in 1910 more than 110 million youth of the United States have been members of the organization. For younger members of the program the BSA instills values through challenging outdoor activities like aquatics, camping and hiking. As the Scouts get older they still have these types of programs but they are also indoctrinated into career oriented programs and community organizations as well. Boy Scouts of America is a member of a larger group known as the World Organization of the Scout Movement. The scouts have three levels: the first being "Cub Scouts" for those boys aged five to 10 and a half years, "Boy Scouts" for boys 10 1/2 to 18 and the last group is "Venturing" for young men up to 21 years of age. The Scouts have chapters that are operated locally and are sponsored by local clubs, churches, educational organizations, civic associations and more. The units are all led by a long list of volunteers who also get support from local councils that use volunteers and paid professionals. The Boy Scouts of America's goal is to prepare the country's youth to make good ethical and moral decisions throughout their life through instilling what the Scout Law and Oath represents. The BSA refers to their goals or roles as "Aims of Scouting", which include: citizenship training, character development and personal fitness. They attempt to reach these goals by using an informal system of education known as the "Scout Method" with liberal variation that is designed for maturity and the difference in age of each of the membership divisions. Each member must wear a uniform that gives them an identity level within each group, known as the den or pack and the entire scout community. The scouts learn teamwork through working and meeting together in their dens that consist of between eight and 10 members with an adult supervisor. The ideals are learned and then applied from the Law of the Pack and the Cub Scout Promise as well as the Character Connections program, which helps to develop the initial values of compassion, citizenship, courage, cooperation, faith, honesty, health and fitness, positive attitude, perseverance, resourcefulness, responsibility and respect. The scouts learn to use the ideals in the Scout oath, law, motto and slogan and they wear uniforms to work as one in group patrols of between eight and 10. They share responsibilities, live together camping outdoors by applying the skills they learn at different meetings. The system of advancement allows for opportunities for self-reliance and personal growth. They interact with their adult leaders who are role models for the scouts as well as their mentors. Those in Venturer's level are expected to live by and know the Oath and Code of Venturing. They work with and associate directly with adults as their partners, while the junior crew is run by elected youth. Venturer's take part in planned interdependent group encounters, which depend upon cooperation. The Boys Scouts of America (BSA) was incorporated on February 1910 by W. D. Boyce in Columbia. Thirty four delegates met on June 21st at the temporary national offices in New York at a local YMCA and developed organizations plans. Founders of Scouting included William Boyce, Ernest Thompson Seton, James West and Daniel Carter Beard. President William Howard Taft became an honorary president and President Theodore Roosevelt became a Chief Scout Citizen and honorary VP. During the incorporation of BSA there were a number of other groups that catered to youths, some that used the same name. A number of troops were already meeting using a variation of the system in Britain. William Boyce's key contribution to the movement was to make it into a business. In Washington, D.C., he incorporated the BSA and recruited a number of young professionals many of whom were from the YMCA, to layout and design the program. He also offered some key funding for the new organization. A national office was established and a handbook was developed. A campaign was later started to include under their umbrella all the other scout membership organizations that were in existence. Only one group held out which was publisher William Randolph Hearst's group known as US Boy Scout. The founders found themselves in a power struggle over the BSA's future direction. West was the original organizer and had the executive board's support on which way the BSA should go, but Seton seemed to always have ideas that were contrary to what the board wanted as well as West. The scouts have not been without their fair share of controversies, there have been allegations of abuse and of discrimination. There have been rumors that this has been going on since almost the start of the program. However, the scouts were proactive and amongst the first national organizations of youths to address the sexual abuse issue and in the early 1980s developed a youth program to help educate the scouts, their leaders and their parents. i love the boy scouts too! I love the Boy Scout program. I have served as a scout master and participated in the program myself as a boy. I regularly use skills developed during that time.